We are very happy to announce that Dreamscape Immersive, a newly created VR entertainment company based in Los Angeles and Geneva will be commercializing our ground-breaking VR technology, Real Virtuality. As you may remember, this technology gained quite some attention in the last couple years and was showcased at Sundance Film Festival New Frontier 2016 and Cannes Festival 2016. 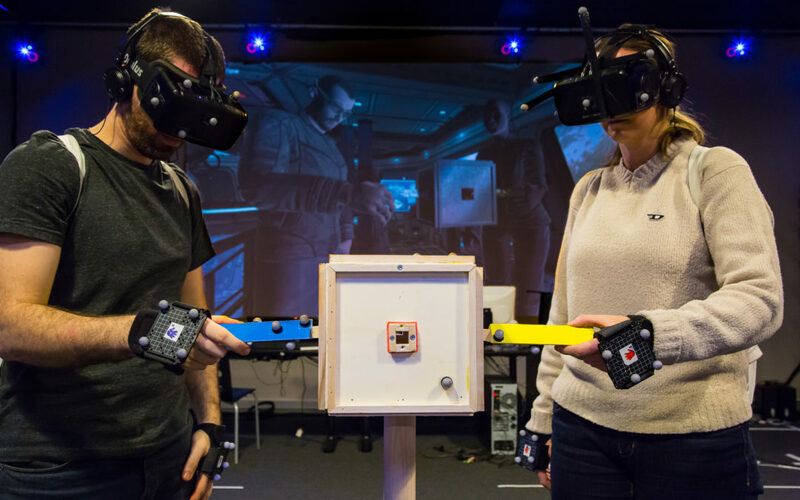 Contrary to other static position VR systems, Real Virtuality allows users to truly feel immersed in a VR scene. They can walk around freely, interact with objects and other players, and truly experience worlds previously accessible only in their dreams! Dreamscape Immersive will offer location based VR experiences. Its vision of the VR Multiplex is to create unique, irreproducible entertainment experiences that are vivid and compelling enough to bring consumers out of the house and into larger social and retail environments. For motion picture studios and other IP holders, Dreamscape provides another alternative for audiences to enjoy both original experiences and franchised properties. The first flagship VR Multiplex will be launched in Fall 2017 as part of the reopening of Westfield’s Century City Mall in Los Angeles. Artanim’s Research Director, Caecilia Charbonnier and Technology Director, Sylvain Chagué, both co-founders of Dreamscape Immersive will serve as co-CTO’s of the newly created company. They will be joined by the third co-founder, Ronald Menzel as Chief Strategic Officer and two co-Chairmen: Walter Parkes, film producer on The Men in Black series, Gladiator, Minority Report, Catch Me If You Can and former studio head at DreamWorks Pictures and Kevin Wall, global live entertainment producer/entrepreneur (Madonna, Jay-Z, Rihanna and more). Bruce Vaughn, 25-year veteran of Disney Imagineering, who served as its Co-Executive Leader for seven years, will join as CEO. Moreover, Dreamscape Immersive announced today the completion of its Series A financing. Initial investors include Bold Capital Partners, Warner Bros., 21st Century Fox, Metro-Goldwyn-Mayer (MGM), IMAX Coorporation, Westfield Coorporation, and Steven Spielberg. The venture also includes a stellar advisory group: Yves Behar, renowned industrial designer, as Brand and Design Advisor; Hans Zimmer, Music Advisor; Dan Fellman, Past President, Domestic Distribution, Warner Bros. Pictures, as Distribution Advisor; and Kevin Ratner, President, Forest City Residential West, Real Estate Advisor.